Don’t let the holiday rush stress you out. 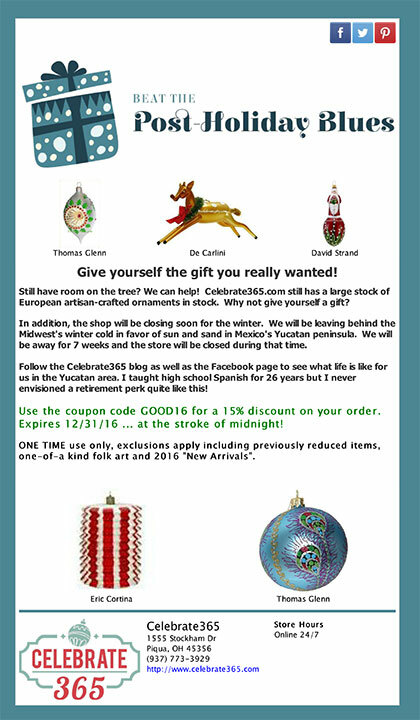 You can find Celebrate365.com “open” 24/7 … although Santa has been known to take some naps! 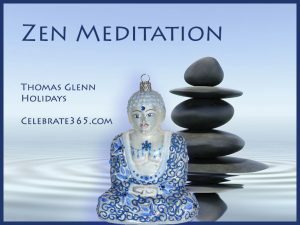 Celebrate365 offers “zen” worthy ornaments from Thomas Glenn, Eric Cortina and David Strand. Stop by and browse awhile! New Arrivals … Just in Time! Do you have a fashionista on your gift list whose “champagne” tastes exceed your budget? Perhaps this “Designer Plaid” ornament might be just the thing. Modern Floral … don’t they seem like snowflakes? Everyone loves penguins! 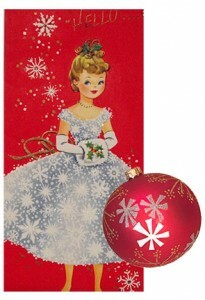 Hang this sweet 4” ball on an ornament turner and they will happily “march” around your Christmas tree. Quantities are limited … so don’t delay! Want to see more penguins or another favorite theme? Click here to enter your search term. We have over 1000 holiday items and usually ship everyday but Sunday. 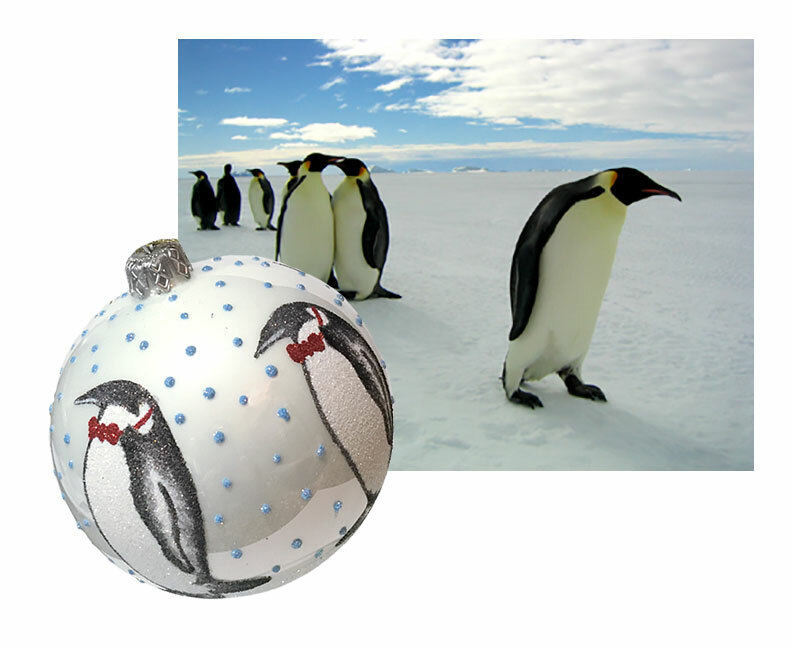 Author Connie PorcherPosted on December 5, 2015 Categories christmas, Collector Tips, design, glass ornament, ornament, Poland, Thomas Glenn Ornaments, UncategorizedTags Christmas ornament, fashion, mid-century modern, penguin, plaid scarf, snowflake3 Comments on New Arrivals … Just in Time! De Carlini boxes organized by style number. 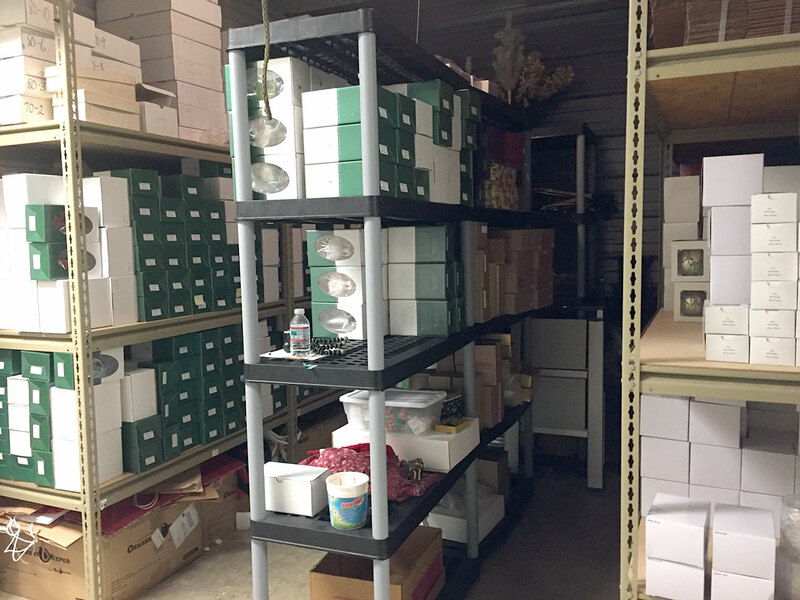 The shelves are stocked and organized … the new ornaments have arrived. We are ready to roll ‘n roll for the holidays! 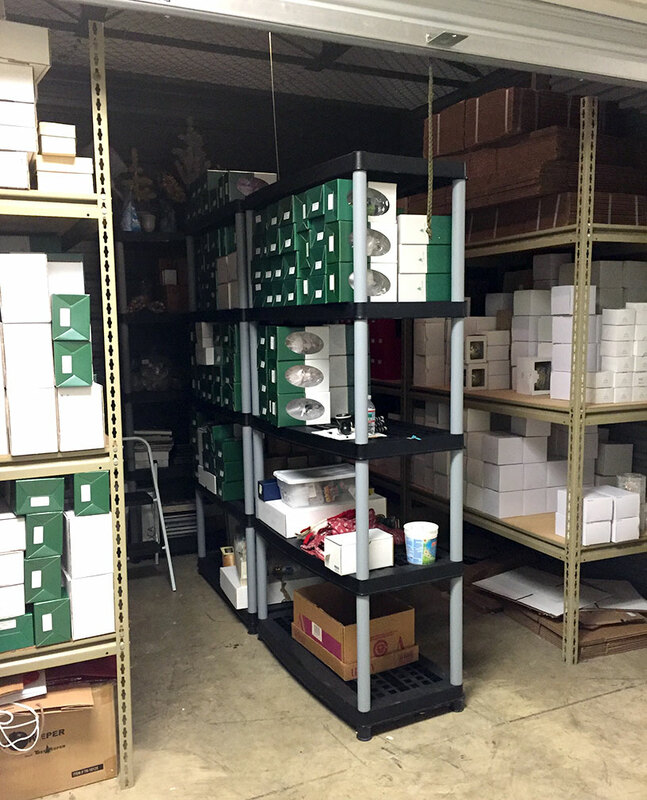 Climate controlled storage … but poor lighting for me! I often use a flashlight when finding ornaments to fill your order! But, the owners are so nice … they let me use their WiFi so I can adjust inventory errors as I go. Let the shipping begin! 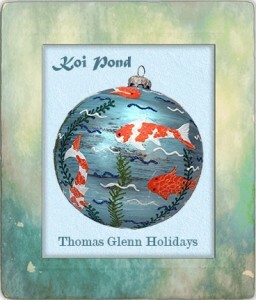 When contemporary artist Thomas Glenn created his first ornament collection in 2000, he infused it with ultramodern colors and graphics. Chartreuse, magenta, turquoise, orange … Are those the colors of Christmas? 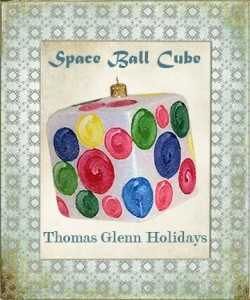 They are for Thomas Glenn Holidays! The Thomas Glenn collection has always been known for using a unique color palette, and I want to continue this and broaden the spectrum even further,” explains Brent Lawyer, current company owner. 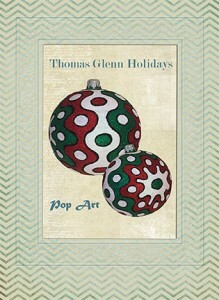 This year’s collection includes traditionally colored “Pop Art”* in red, green and white. But, that’s where “tradition” ends. 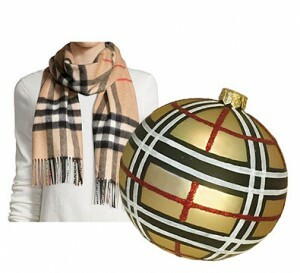 You won’t find a Christmas tree or Santa on this ball ornament. It’s fully glittered with circles and squiggles. A sunburst-style graphic creates the central motif. Lawyer also created a blue and green version of the design. Lawyer also continues with Glenn’s more “traditional” style designs as well. Thomas Glenn collections always maintained a strong Asian theme. This year’s “Koi Pond” depicts these brilliantly colored ornamental Japanese fish as they placidly swim through still blue waters. Collectors can delight in bringing Thomas Glenn works of art into their own home and onto their holiday trees and year-round displays with these exceptional European crafted ornaments. Artistic vision continues in 2015. *Pop art is a movement that emerged in the mid-1950s in Britain and a few years later in the United States. Artists like Andy Warhol and Roy Lichtenstein attempted to connect fine art traditions with pop culture elements from television, advertisements, films, and cartoons. See moma.org/learn/moma_learning/themes/pop-art for more information and examples.